I drew the silhouette on the door, a friend cut out the shape with a jig-saw, sprayed insulation foam into the hollow door and let that dry. Then I covered the cut edge in papier mache, primed and painted it. 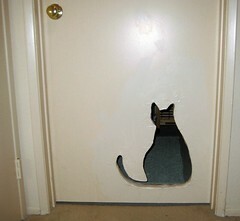 (I have the same sort of hole our bedroom door.) 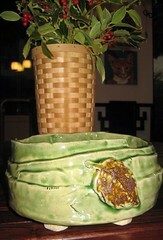 I like to think of our house as an artist's house---not a cluttered, eclectric, collector's home--ya know? Thanks so very very much to the generous anonymous donors of the $5,000 challenge grant, and to the Current Wisdom Foundation and to the individuals (noted below) Mundo Lindo has raised $10,000 and will start up again on Thursday, January 14th! The free two hour class runs 3-5pm every Thursday, and pre-registered 4th & 5th grade students, from the Escondido School District will begin a year long art adventure. BIG thanks to : Cheryl Gaston, Rick Keating, Jim Kelly, Andrea Cassilas Hein, Virginia Sumner, Gary Carpenter, 10 North, Gillian Moss, Linda Shaw, Helen Shafer Garcia, Rachel Kopel, Nancy Lemke, Elizabeth Chiment, Seema Sueko, Ellen Speert, Wendee Lee, Lori Mitchell, Susan Avery Clark, Maureen Griffin, Rachel Grant, Kent and Erma, and Jo Ann Bryan. Thank you--from me and most especially all the kids! 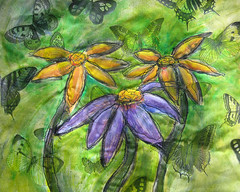 Through out the year, California Center for the Arts, Escondido Education Department will continue to fundraise for the year 2011. Hope I don't hurt my arm patting my self on the back for my cleverness......I made these cocktail napkins from my Spoonflower fabric! 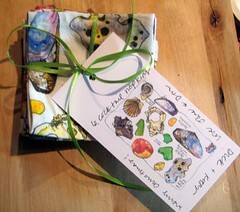 and then printed a tag with the watercolor journal page I used to create the fabric......Here's a view of the napkins. Cute, huh? 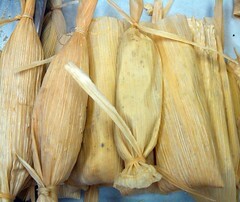 They will be Christmas gift. Uh oh. I feel it coming on. Another series of hand stitched pieces. This is the 3rd of the green series, and there are more on the way. This is about 7x11" and machine needle-felted first (broke 3 needles of 7! ayk!) and then seriously hand-stitched. And if you follow my blog, you recall my 'quiltlets,' which are numbering about 21, and are still unattached. No problem, I tell myself. Im an artist! It's the process! Seriously, I am thinking about laying all the quiltlets out on the dining room table and starting to assemble them into one big piece. I'll keep you posted. 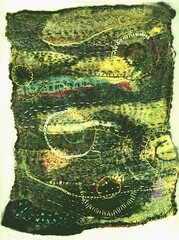 Meanwhile, I'll be stitchin' on my green series. 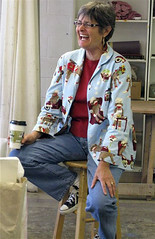 I have room for a few more students in my Wet-Felting workshop, on January 9 in Escondido, CA. 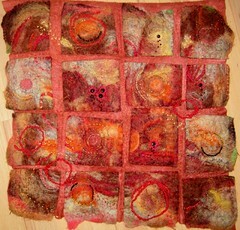 "Mixed Media, paper on cloth"
We'll cut and glue and paint, with cloth as our base and paper as our collage medium. Learn fun, loose, easy techniques to create a small art piece of your own design. I've had a needle felting machine for about a year. Every time I use it, I break needles like crazy! 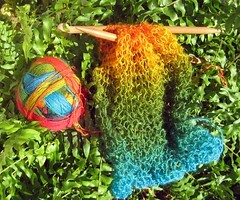 This piece is about 8x8 and I broke 4 needles (out of 7) making it. And, the needles are not cheap! So, this afternoon, I'm taking a lesson at the where I bought the machine. I really hope I can learn how to not break needles! And, I'm teaching a new class online on joggles. It doesn't start till March, but you can check it out and register now. 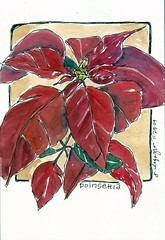 And, don't forget Art Unraveled will filling classes at the end of December--and I'm teaching 3 classes, so sign up! As a totally loyal subscriber and fan of Quilting Arts and Cloth Paper Scissor, of course I buy their Studios magazine too. 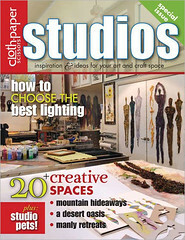 Mary Fisher's amazing studio is pictured on the front and in the magazine. Imagine my surprise, when on page 23, Mary Fisher mentions me!! 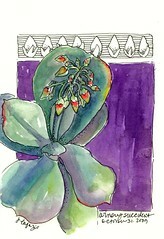 And I quote "...watercolor(now that I've learned it from Jane LaFazio)." Can you believe how incredibly kind it was of her to mention me!! Really, I'm very moved by this. 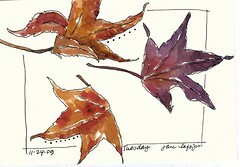 I met Mary just once, at Art Unraveled last year, when she took my "Sketching & Watercolor: Journal Style." And while I'm thanking generous women, I must mention the powerhouse Pokey Bolton! She has published me in her magazines numerous times, included me on her TV show, and at Make It University at the Quilt Festivals and I consider her a good friend, which thrills me no end. And that leads to Lesley Riley, who introduced me to Pokey by writing an artist spotlight article about my quilt "Ralph's Letters." Cloth Paper Scissors Jan/Feb 2007. It's thanks to Lesley I've been on this wild ride of being published. So huge thanks to the many generous women in my life! Pokey, Lesley and Mary and many more. 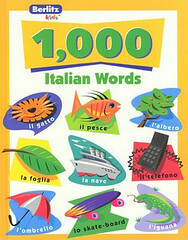 I think this is the book for me! My trip to Orvieto is a go, so I'm really getting excited!! We've got 7 with room for just 3 more! Here's the Registration form and final payment is due February 10. If you've got an logistical questions, please email Bill and Kristi our most wonderful hosts. Oh my, we had just too much fun at Barbara and Nancy's yesterday! Linda came too, and we ate, drank and laughed our way through the day, making art and altering christmas cards. Great time! 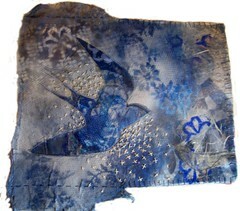 A collage made from Cyanotype leftovers and stencils and stamps and then of course hand-sewing. It needs a title. Any suggestions? 12/9/09: Thanks for the title suggestions! Denise and Mary (on facebook) both suggested "Night Flight" and that one spoke to me. thanks everyone! I'd posted this one before, but without the lace in the left corner. Now it's finished. 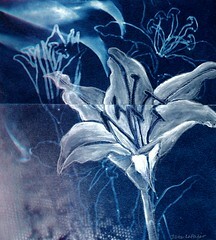 Cyanotype (AKA sunprint) then painted. I painted this yesterday, as I taught a workshop in Encinitas. 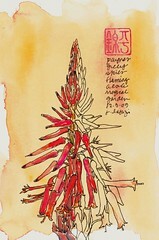 The garden was full of these blooming aloes, and it would have been fun to do a series. I added the chop (in Chinese means Plain Jane) once I got home. It was cloudy but not too cold at the workshop yesterday. The garden was glorious as usual! Our first decoration of the impending holiday season. This year it's my turn to write the holiday letter/recap and husb's turn to illustrate the card. We alternate, and have been creating our own Christmas cards for...at least 15 years. I use to make cards that could hang on the recipient's Christmas tree, but as our own tree got tinier, I just make cards now. Scan, write and print out at home, then mail. So, I guess I'd better start writing! 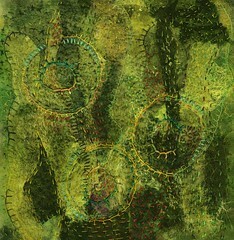 Inspired by the current exhibition, Stephen Curry: Next to Nothing, at the Athenaeum in LaJolla. 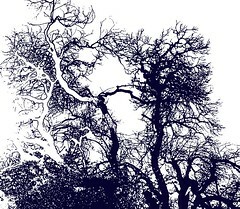 I've been taking photos of the trees to the sky and then do minor tweaking in Photoshop (I really know very little about photoshop). Not sure how these will influence or work into my art, but I like 'em. 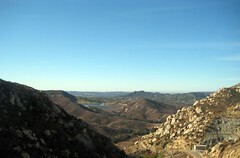 Husb and I joined a docent and a small group for a hike in Blue Sky Reserve. 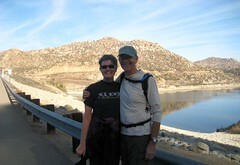 We hiked up to Ramona Dam, that would be 5 miles RT with an 800' altitude gain! Great hike and we hope a wonderful new tradition for the day after thanksgiving. You know, I teach on joggles.com but I also take their online workshops too. 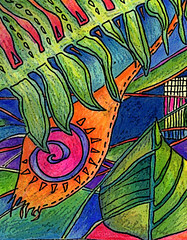 Here's a small portion of a piece I'm working on in Janet Lasher's joggles class. It's layered and hand-stitched (hello carpel tunnel!) and it's going to be a little portfolio. If you click to enlarge, you'll see it's made of photocopies of my cyanotype/sunprints. And my black wing bird stamp makes several appearances on this. And happy thanksgiving dear blog readers! I'm thankful for you, for my creativity, for my strong hands (particularly after stitching on this project all day) and my dearest husb. Upcoming: December 5 in Encinitas at the gorgeous California Center for Creative Renewal, Sketching & Watercolor: Journal Style. Register through Ellen at ellen@artretreats.com or phone 760-436-3310. 9-5. Collage 101 on December 12, 1-4 pm, at Bravo Workshops Register: 619-223-0058 or workshops@BravoSchoolOfArt.com $44 plus $5 materials. We have autumn in California. You just have to look for it. Another page from my morning at the winery. I mentioned our sketchcrawl group went to the museums to draw. I chose to draw straight to ink, with a more or less continous line. I got lots of pages drawn this way, it's quick and fun to do in a museum, where they won't allow watercolors. I filled in a little color later at home. 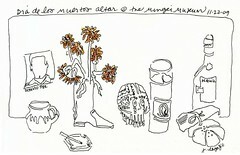 A Dia de los Muertos altar at the Mingei Museum. The exhibits at the Mingei Museum are always fabulous but the works, story and presentation of Sonabai was especially moving. 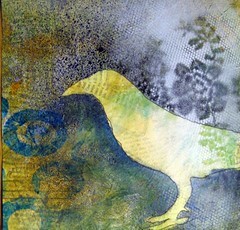 These little birds are by an artist from her village, in her style of working. 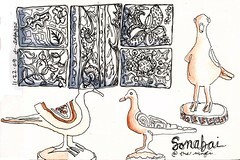 The patterns are those wonderful wire stamps make for block printing fabric in India. I did this in a quick, straight to ink continuous line. 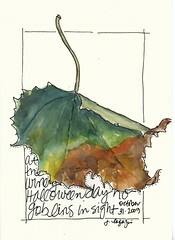 I taught a one-on-one "sketching & watercolor: journal style" today at the winery to Cynthia from Portland. We spent a lovely morning at the winery drawing and painting. 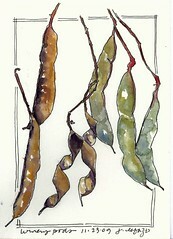 First we did continuous line drawings to warm up, and here's mine of the pods. 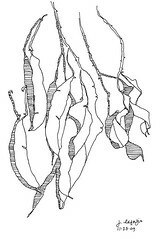 I can see this as a texture stamp, or maybe sewn lines on a quilt. 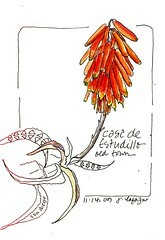 We had a wonderful sketchcrawl yesterday! Eight of us met in Balboa Park sketched the morning at the fabulous Mingei Museum, my favorite museum in San Diego, then met for lunch and sharing our journals (photo) then a few of us went to the San Diego Museum of Art to sketch for a few more hours. Just a terrific day. Hey, Art Unraveled website is up and you can register right now and they'll begin filling the workshops on December 15 for the August event! See registration details on the AU site. 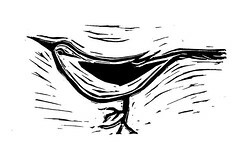 I drew a page of very quick continuous line drawings of some little artificial birds, they turned out so cool and funky, that I carved this stamp from one of them. 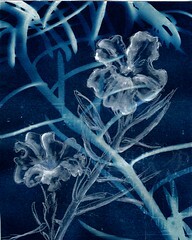 Another cyanotype (sunprint) creation. Thanks to my fellow artist and friend, Linda Blinn, she and I are really getting into all the things one can do to turn the simple process of cyanotype into a more complex art piece. For this one, I drew and painted on a finished sunprint. This was my quick demo at the workshop last saturday. One of my new friends is considering going to Orvieto with me and asked about traveling alone. * About half of those who travel with us are single, which is nice because it isn't all pairs. Currently with your group, it looks like 2 are traveling alone. From the very beginning we get together, meet each other, and start the process of becoming friends. Nobody does anything alone unless they want to. Our groups are small so it is easy to get to know the others. Orvieto is unbelievably safe, feels that way because it is clean with lots of people about everywhere, is not big so there's no getting lost. Consequently, a single woman feels very comfortable there. * We gather people's travel plans and help them hook up at the airport to travel to Orvieto together. Most planes from the US arrive in the morning at similar times so it is easy to meet. Our folks share pictures of themselves and we provide pictures and suggestions for where to meet. We also send a very detailed travel guide with pictures and instructions for getting to Orvieto. No one has been lost. * We don't yet know if people will be staying on after our trip. They usually do. This fall, two ladies who had not met until they got to Orvieto planned the post-trip activities together. These conversations and planning is one reason we will set up a group - to facilitate it all. 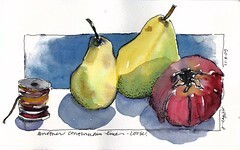 The Bella Italia: Orvieto Sketchbook workshop is May 23-29. Husb and I will be arriving a few days before the official start, and our plan is to travel to Venice the following week...I promise I won't wear my pajama jacket from the previous post! 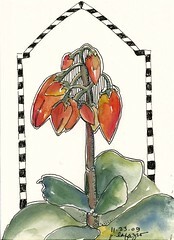 This is one of my drawings from yesterday's visit to Old Town. It's tiny, about 2 x 3" and the rest of the page is empty! 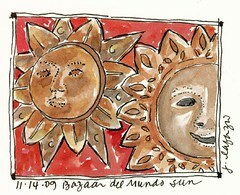 I plan on adding to it....Maybe from our sun collection on the back patio. 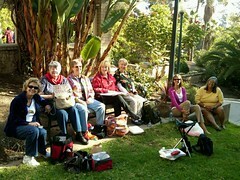 Yesterday, I taught a "Sketching & Watercolor: Journal Style" workshop in Old Town, San Diego. The weather was perfect and the people in the class delightful! 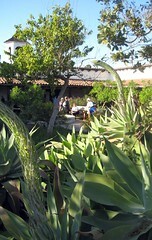 Here are some of the students in the garden of Casa de Estudillo an 184 year old hacienda. 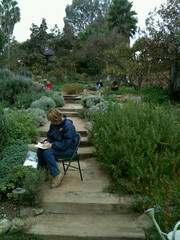 My next "Sketching & Watercolor: Journal Style" is on December 5 in the gorgeous gardens of the California Center for Creative Renewal in Encinitas. Email Ellen to register. I took this to my framer today.....It will be at the Amigos de Allende Reception on November 21, 3-6pm in San Diego. 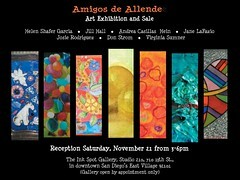 If you're in San Diego, come join us at the Amigos de Allende reception. And oh so practical! 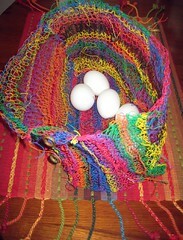 here's my completed basket. 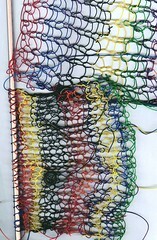 I knit the sides and bottom with telephone wire. I did this artsy photo with the eggs, so you could gauge the size. Funky, huh? You know you can check my website for classes and workshops, but I wanted to give a heads up on some recent additions (not yet on the website). I'll be teaching at Idyllwild Summer Arts Program July 4,5 and 6th. 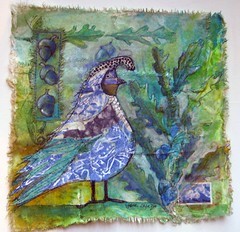 A 2-day Mixed Media with Paper & Cloth and a 1-day wet-felting workshop. 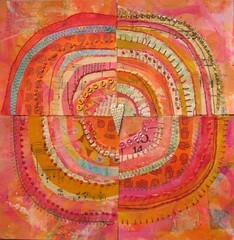 And I just got word that I'll be teaching 3 one-day workshops at Art Unraveled in August 2010, Recylced Circles; Sketching & Watercolor: Journal Style; Duet: Watercolor Flowers & a hand-carved Stamp. 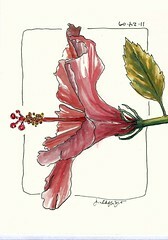 And a week at the Montecito Family Summer Camp, (week 9) August 15-21st of morning workshops in Sketching & Watercolor. And while I'm plugging, don't forget the week in Orvieto Italy May 23-29. The trip is a go, with just a few spots left! Gosh, 2010 is promising to be quite an exciting year! Another semi-continuous line, loosey-goosey drawing. I'm having fun working freely, not quite knowing how it will turn out. And I love drawing and painting pumpkins! A loosely-goosey continuous line, watersoluble ink. Wonky, but with a certain, subtle charm. 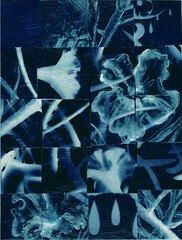 I cut up the other one and created this cyanotype collage. I honestly don't know if it's an improvement or not, but it was a very good exercise, and a concept I'll play with some more. But this time, I'll plan better..........famous last words!